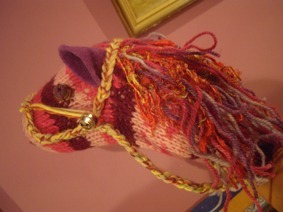 I have promised a few folk I would put together a ‘how to make a hobby horse’ tutorial. 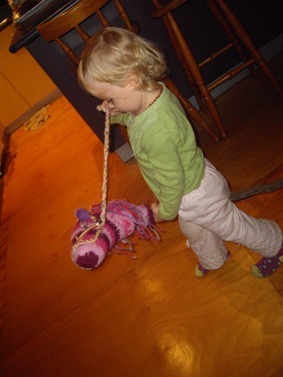 Before I begin I need to credit the inspiration for our first hobby horse – a dear friend Naomi, who offered words of advice on how to fashion a hobby horse when I commented on the one in her son’s play things. Thank you Naomi for your inspiration and guidance. 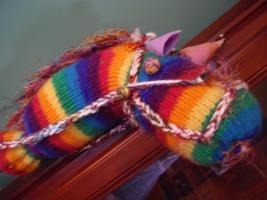 I also need to say in advance that the photos are not of great quality, our camera was on it’s last legs over Easter and during the making of this hobby horse. Hopefully however, the images, as poor quality as they are, will assist in supporting the instructions a little. • File and sand off any knots etc on the stick, so it is relatively smooth and will not knock and scrape the child’s legs/thighs when riding. 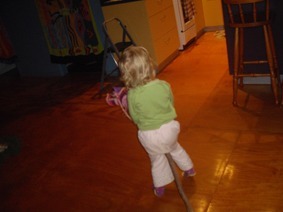 Ensure stick is smooth. 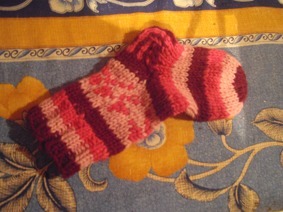 • Begin to stuff firmly, the sheep’s wool into the top of the sock (toe area). 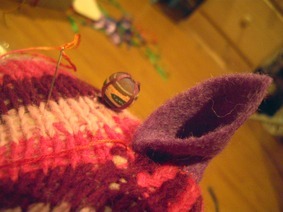 Once you are around the heel area – insert the stick end that will be at the top (head area) of the hobby horse. 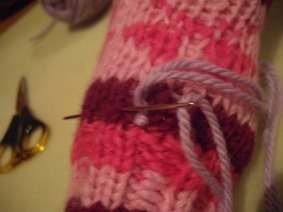 Wedge it up into the stuffing and be sure the top point of the stick does not poke out anywhere onto the sock without stuffing around it. 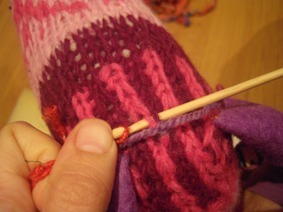 • Continue stuffing the head – around the stick – forming the shape of the head as you stuff and ensuring the stick stays in the middle of the sock. 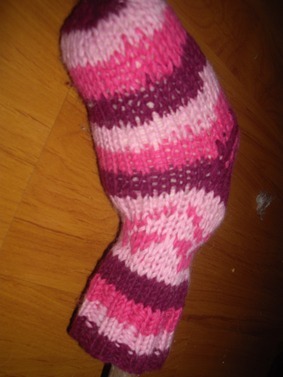 • When the head is stuffed firmly (always use the golden stuffing rule of ‘when you think you are done – add one more piece!’), leave the ‘cuff’ of the sock free from stuffing, so you will have a ‘skirt’ of empty un-stuffed sock around the bottom. 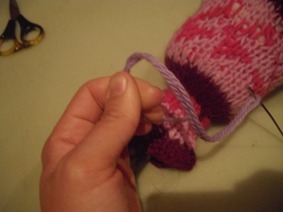 Sew a running stitch around the cuff, just under where the stuffing finishes and then pull this tight to draw the cuff in – sealing in the stuffing. 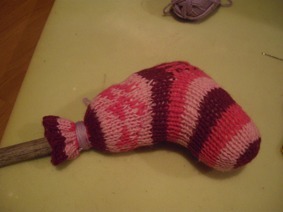 Be sure to keep this tight as you tie off to seal and finish nicely the head shape/filling. 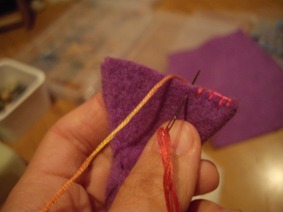 • Tie this off and bring the thread through to the underside to cut off – leaving a neat outer to the finishing. 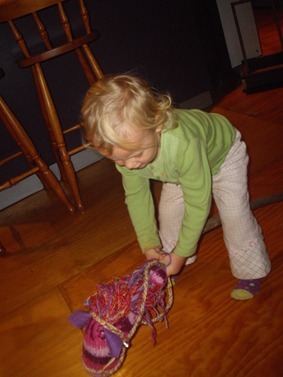 • Wrap tightly a piece of yarn many times around – over and under the area where you tied off the head – this further secures the head. 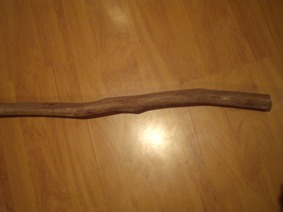 • You should now have the horse head shaped and the head firmly and securely held on the stick. 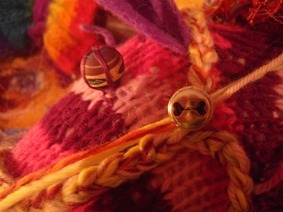 • Position these on either side of the head and sew on with embroidery floss. 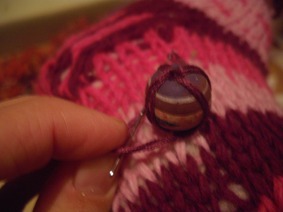 Knot off by securing the thread and then looping and knotting the thread around the bead and drawing the knot in under the bead. 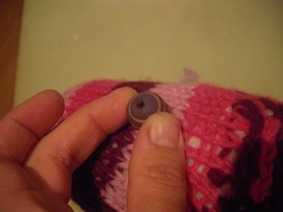 • Pull the floss through the under of the sock and pull tightly – clip and then the end will disappear back into the head. 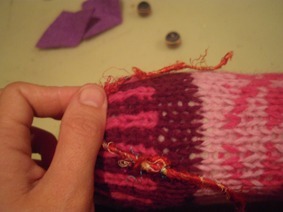 It is better than cutting close to the knot – if you do this, the thread can slip undone easily and the eye will fall off. • Hold a corner of the wool felt folded over like an ear – on the side of the head and form the shape needed for the ear – cut two as needed. • You will have a shape that looks something like this. 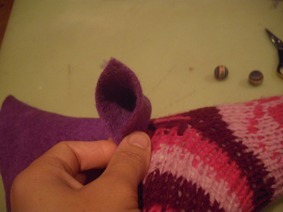 If you had holes in the heel and are making a ‘hobby unicorn’ – then cut a similar shape that can be formed into a cone, sewn, stuffed and fixed into the heel hole. 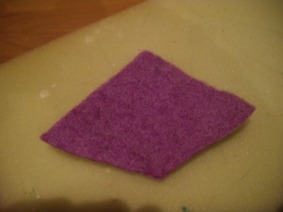 • Blanket stitch the ends together that will be fixed to the horses head. 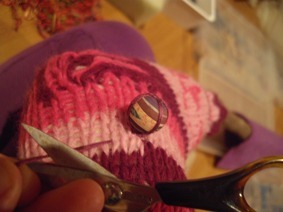 • Sew the ears to the side of the head in the appropriate places. • This picture gives you an idea of positioning for eyes and ears. 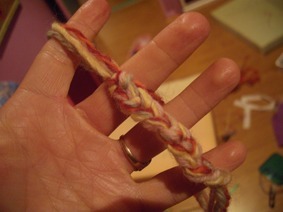 • Decide an appropriate length for the mane and cut a bunch of yarn threads to this approximate length. 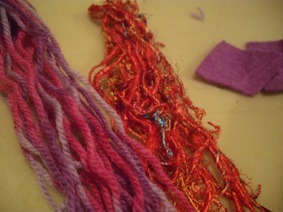 • A mix of yarns gives an interesting result and I always like to use sari silk in the mix. 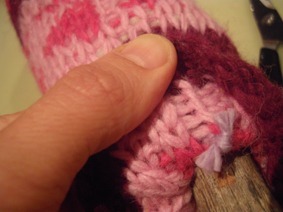 • Use a medium gauge crochet hook to insert through the sock knit and hook the yarn for the mane – bringing the center of the yarn piece back through the sock. 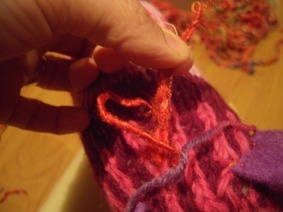 • Slip the two ends of the yarn through the loop created by folding the yarn piece in half – pull tightly to secure. • I always do a centre mane strip, then strip either side of the centre strip. Any few left over pieces of yarn I add between the centre, left and right runs – at the top of the mane for a ‘fuller’ look. The mane length can be trimmed once completed if necessary. 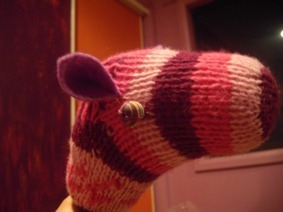 • Finger knit a long length to sew onto the head as reins and a holster. • This picture gives you an idea of the pattern we use for the holster. I go from just under one eye, up on a slight angel to just under the ear, up across the head, to below the other ear point, down to under the eye, straight along to the ‘cheek’ area, up and across the nostril area (behind the nostrils if you have nostrils) and back along to the starting point. 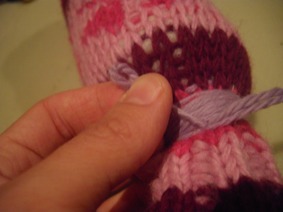 I secure each point by sewing with embroidery floss – the finger knitting to the sock. From the ending point – I loop the left over yarn down around the back of the neck/mane to sit over the stick and be reins for the rider to hang on! 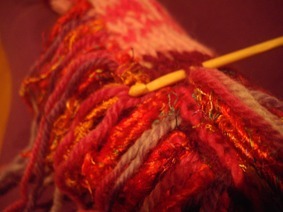 The loose ends, at the start and finish point I tie up diagonally to the nostril space. • At the start and finish points of the holster – I fix metal bells. If I have a unicorn horn, I fix a tiny bell to the top of that as well. I hope you have enjoyed this tutorial and the photo’s and instructions have been clear and easy to understand – Enjoy creating and have many hours of ‘horsing around’ creative play fun!